mei 2014 | 385 blz. 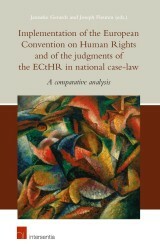 The European Convention on Human Rights has great impact on national law, in particular through the case-law of the European Court of Human Right. Over the past few years, however, critical voices have been raised to question the degree of the Court’s influence on national law and politics.